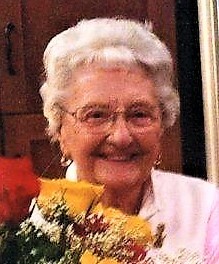 Born November 22, 1922 in the Netherlands, Catharina passed peacefully in Royal Inland Hospital, Kamloops, BC on September 17, 2018. Catharina came to Canada as a war bride in 1946, was predeceased by her loving husband Bill; they met during Bill’s Army service in Holland. They started their Canadian life together near his birthplace in the Chase Creek valley. They ranched and logged successfully together until retirement in Kamloops. She leaves behind many good friends and nieces and nephews in the Netherlands. Catharina came to love Canada and the outdoors and very much cherished her daily walks up Kenna Cartright Park. In lieu of flowers, donations to the Kamloops Hospice will be appreciated. Catharina’s hearts desire was to be reunited with Bill. Many times over the years since he passed away she expressed that to me whether in person during visits or on our many phone calls. My family and I have many fond memories of times with Bill and Catherina and in recent years with Catherina. On my most recent visit a month ago with our oldest grandson, she loved on him and hugged both of us as if she knew she would not see us again in this world. We will cherish our memories of you Catharina. So sorry to hear of Catharina’s passing. She was a lovely and caring woman. Our deepest sympathies to her family here and in the Netherlands . From the moment my parents, Tom and Gay Timmerman moved to the Chase community, Catharina and Bill became some of their closest friends. They always kept in touch even after the Humphrey’s moved to Kamloops. After the passing of their husbands, Catharina and Gay continued their friendship during regular shopping visits. Our family was overjoyed to see her at my mom’s celebration of life, all the while struggling with her own health. My husband and I just learned of her passing today. We are sorry to hear we missed honouring her in the way she did for both of my parents, however, please know that we loved her very much. Catharina was a delightful, beautiful woman who had a positive impact on our family and will forever hold a place in our memories. Our condolences to her family and friends.